Many national peacekeeping training centres worldwide subscribe to NTCELP. Under NTCELP, national training centres provide their classroom students with a blended learning curriculum that combines their classroom courses with POTI’s e-learning. Students earn Certificates of Completion jointly issued by both institutions. 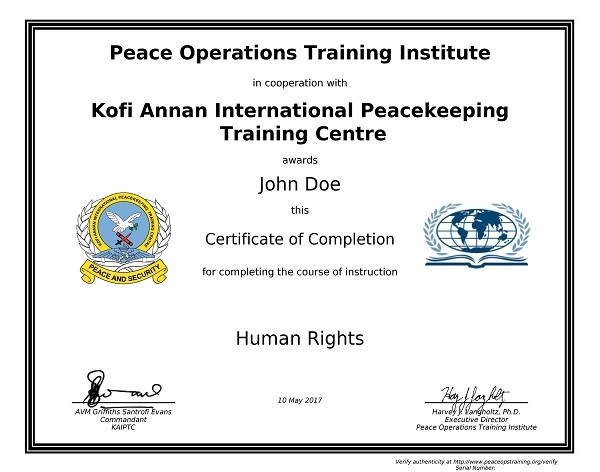 Students who enroll in POTI e-learning through NTCELP and their national peacekeeping training center earn a Certificate of Completion as shown above that is jointly issued by their national peacekeeping training centre, and bears the signatures of their Commandant and the Executive Director of POTI. Find your national training centre listed below and sign up for your free peacekeeper training courses through NTCELP.